to stand on the sand and simply to stare. as we played 'run away' from the wavelets at play. I love the sea, I am moved by it's power and beauty be it stormy or still it enchants me, I feel calm with the wind in my hair, the salty taste on my lips from the splashing waves and the healthy glow it gives me - also known as windburn. So when some friends invited me to take their horses to Lady Anne's Drive, Holkham Beach I jumped at the chance to tag along and although I wasn't fortunate enough to take Oscar (our day will come) it was an exhilarating experience that I recommend to all. Holkham Beach is in Norfolk and open 365 days a year, you'll find a beautifully presented car park with a dedicated area for horseboxes and trailers at £12.00 per day and I was happy to see debit/credit card payment facility for those of us who like the Queen, never carry cash- as with any car park I can't stress the importance of locking your vehicle securely when you leave it, please don't let the excitement get the better of you. After unloading the horses, we look a short ride through beautiful woodland, there was even a little log to jump...we weaved past the sand dunes taking care not to ride on them, to reveal the most beautiful beach I have ever seen. It was silent, the pure white sand stretching long and far in the distance as the bright blue sea rolled gently on the horizon, queue happy sigh....and that is where we spent our afternoon paddling the horses in the sea, some spooked at the waves, others showjumped them before heading for a gallop! A stretch of the four mile beach was walked prior to the horses being let loose, checking for soft, deep patches and once the riders were happy it was safe, set off for an exhilarating gallop or two...followed by many happy canters in the sunshine. Enjoy the video, apologies for the naughty word at the start...the runaway dog is from a rescue charity, he has recently been re-homed and isn't used to such freedom, or fun! I recommend you read this before visiting and be aware of tide times. 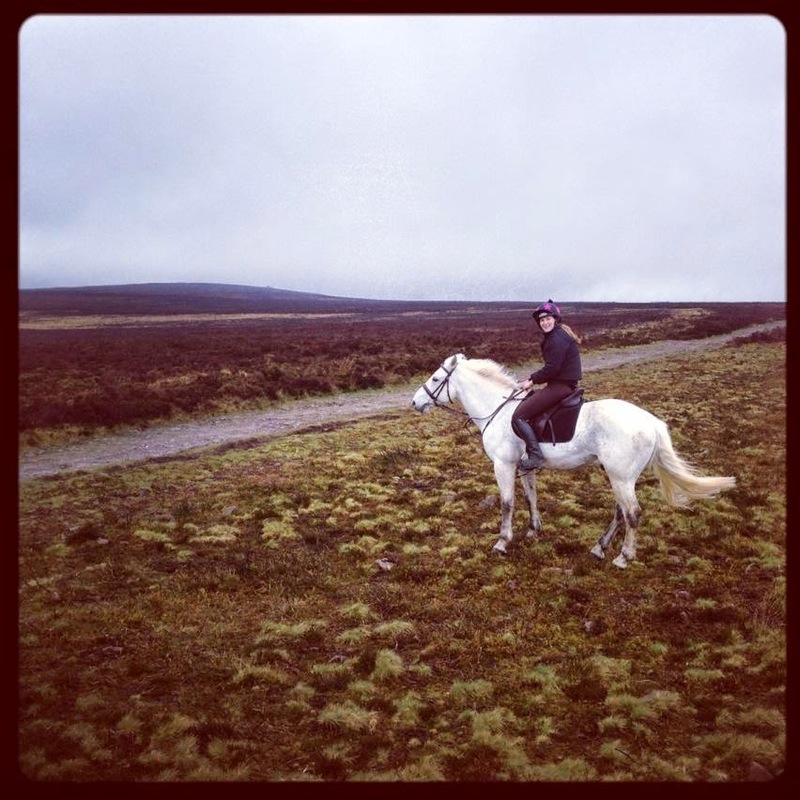 Not Oscar, but a close second, me having a ride on Marley pony. The blissful weather we're enjoying in the UK has meant more hours in the saddle...I have gone from ticking Oscar over in the indoor ménage with a thirty minute schooling session to lovely long hacks as the sunsets and the temperature starts to drop for the crisp Springtime evenings - **happy sigh** I love our beautiful seasons. I know Oscar is feeling the warmer weather as upon untacking I have had a sweaty saddle patch to deal with...this resulted in me diving head first into my treasure chest of grooming lotions and potions to pull out my trusted Barrier Revitalising Wash Shampoo. I only have to open the bottle and it takes me back to Summer days, the refreshing scent from the natural peppermint and spearmint oils are delicious and it gets a huge thumbs up from me due to it's minimal lather meaning there is no need to wash off after use - and this a truth, I never rinse off after using it and Oscar's coat is never dull, dry, sticky or fluffy, the product is invisible...or as I should say, natural - this also means it is free from all prohibited substances under current FEI and HRA rules. The peppermint and spearmint oils instantly refresh and cool the skin without chilling the horse, I always use lukewarm water when I wash off - unless in a heatwave, very rare here in the UK - and I believe washing sweat off your steed is important as the salt from sweat will dull your horses coat and can irritate their skin, nothing worse than a scurfy coat and a dusty grey hand! Barrier Revitalising Wash Shampoo also contains nourishing coconut, one of the kindest yet most thorough substances to cleanse the hair and skin leaving it silky soft. I use one capful to one litre of lukewarm water, dip in my sponge, squeeze it out (to avoid getting the coat too wet) and gently rub the damp saddle/girth area and there is no chore to get fresh water and a clean sponge to wash off....so easy, there is no excuse not to do it. I have owned the Ariat Team Stable Jacket for many years and it's still going strong, I wear it all year round and it certainly proves it's worth during April showers...as it did last Saturday for me when I rode to my lesson is sleety rain! Who else thought it was Spring? The Ariat Team Stable Jacket is my perfect blouson, it's waterproof and wind resistant with a lightweight polyfill lining, this means I can layer up underneath it in Winter to keep warm and dry, and in Springtime showers I can pop it on over a t-shirt, it's breathable and won't let the rain in! 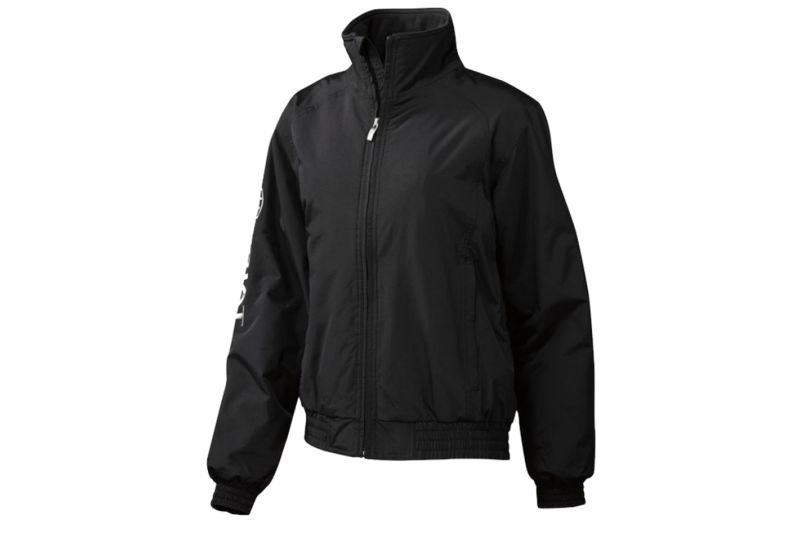 Thankfully Ariat have kept the design of this unisex jacket simple and classic ensuring it remains stylish year after year, the most popular colours are blue and black, in a range of sizes from XS to XXL (I am a size 8/10 and a size Small fits perfect). The jacket has elasticated wrists and waist to keep the elements out and the Ariat logo on the arm, three pockets, two outer and one inner all with zips to keep important things safe when riding and it washes perfectly as mine gets thrown in almost every month in Winter (who else finds the horsey wee smell sticks to them in Winter.....?). 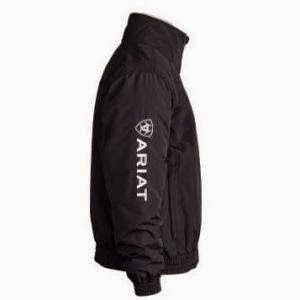 A short and sweet review but the Ariat Team Stable Jacket makes my life riding out and around the yard easy and therefore had to be recognised. Do you know that dress in your wardrobe, the one that was love at first sight...it was an expensive purchase but it looks and feels gorgeous and although it makes you smile every time you see it, when you put it on it just isn't as perfect as it should be? How many of you are nodding at your screen right now...? It's heartbreaking, and this is exactly how I feel about Oscar's LeMieux ProLambskin Half Pad, we've owned it for two years now...it's been at home - far too posh for the tack room, and worn all of three times, because it just isn't right for us. For those of you that haven't had the opportunity to cuddle a LeMieux Lambskin Pad I recommend you do this, whether it be in your neighbours tack room or at a Horse Health event stand...it will cuddle you back! The wool is 100% Austrailia Merino Lambskin, it is so soft and dense and beautiful and cuddly and oh my, just gorgeous and don't allow anyone to judge you, I've cuddled mine far more times than I've ridden in it! Apart from being super soft, it has a super design too, the spine is swept clear of lambskin and it is curved upwards at the wither, relieving the spine from any pressure and allowing airflow. The half pads have velcro d-ring tabs and can be worn alone, straight onto the horses back or with a thin saddle pad underneath, sounds perfect...right? Well for some horses yes, but not for Oscar and I - the curve shape of the pad isn't right for us, because Oscar isn't a high withered horse so it leaves a lot of space at the front, and when worn with a saddle pad underneath there is too much material for a native pony, and because of my love for this half pad I have tried it alone, desperate to make it work for us, however due to Oscar's shape it didn't feel secure enough, I needed girth straps. This post is a farewell to my LeMieux ProLambskin Half Pad and although it didn't work for us, I know many horse and rider combinations hugely benefiting from this design, the quality from LeMieux is exceptional and once this has sold I will be looking to try other designs from the Lambskin range. There's nothing better for a horses back than natural wool it promotes blood circulation - is fully breathable, maintaining optimum temperature in summer and winter - regulates humidity controlling the breeding of bacteria and viruses and prevents bruising, scarring, chaffing and pressure sores.